Mysterium is a multi-sensory performance that combines the auditory, visual and olfactory senses. 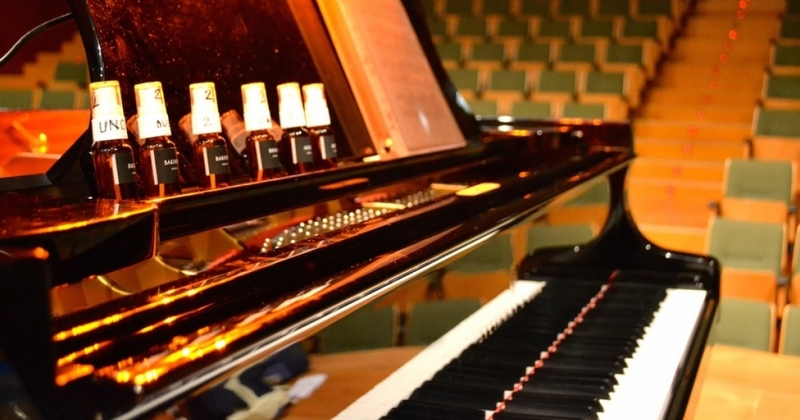 Piano music, colored lights, and specially designed fragrances are carefully blended to deliver a piano performance that offers the audience a deep emotional dimension. Perfumes are created by maitre perfumer Sileno Cheloni of AquaFlor in Florence. Colors and light design are a creative work by the talented American engineer Samantha Stout. Influenced by the synesthetic concepts of the Russian composer Alexander Skrjabin, with colors associated to sounds and keys, as in his “Clavier à Lumière”, the project aims at providing the audience with a new aesthetic experience. Fragrances specifically designed to interpret the piano scores will be diffused among the audience in three moments of the performance, associated with a spectrum of primary colors on stage. This unique performance pushes the boundaries of the listening experience through the creation of a panoramic scent-scape. “Scientific studies have shown that the perception of smells – because of the proximity of the olfactory apparatus to the human limbic system – produces a powerful evocation of images and memories and amplifies the emotional experience induced by music,” comments Maestro Artese. The performance of 12 Preludes op. 11 by Alexander Skrjabin stands at the heart of the program, preceded by selected works by Debussy, Chopin, Grieg and Rachmaninov. Last section of the program includes original compositions by Antonio Artese. Inspired by Sileno’s essences, the piano suite “Lakes of my Mind” is a series of inner portraits triggered by olfactory memories. “Inner Garden” (2015), performed in its world première in Palma de Mallorca on February 10, represents the multi-sensorial distillation of images, scents, and sounds of a stroll among the “Orto dei Semplici”, the botanic garden in Florence.